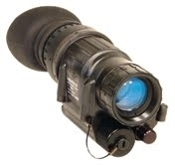 Night Vision Devices PVS14 3rd Generation Night vision device with WHITE PHOSPHOR High Performance tube. Same great warranty as you get with our green tube PVS14 HP+ model, just with a WHITE PHOSPHOR tube. Many people think the White Phosphor (WP) tubes offer better visibility and resolution in use over normal green NV tubes. Equivalent Background Illumination 2.5 max. Unprecedented 10 YEAR warranty, buy with confidence! All standard Military parts means good LONG TERM logistics 20-30 years in the future versus a knockoff unit that uses a lot of proprietary parts. Uses 1 AA battery. All our manufactured PVS-14s use a brand new battery housing that will cut off power to the PVS-14 when the unit is flipped up in a helmet mount. For quickest processing and shipping- 1. Use Visa/Mastercard only. 2. Read and respond to the "Order need response" email that you will receive after placing order online (or Call to order). NOTE- White Phosphor tube units take a little extra time to ship versus our green view PVS14s which typically ship in just 1-2 business days. We say "allow 2 weeks" on WP TUBES but they usually take less time than that. Definitely way sooner than 8-16 weeks that some take to ship!!! !